Which of course only makes sense to me right now as I write this unless you happen to read it in January of whatever year it is when you read this. A valid question in most cases, but for those of us that at times are shuffling about covered in restraints with RLV restrictions on our IMs it’s actually sort of handy. By stepping into the booth you’ll be given permission to “call” one person – that is you’ll get the ability to send and receive IMs to that person. The call can only continue as long as you remain in the booth, and the booth will prevent you from TPing away so you can’t cheat. There are a couple of options that the owner of the booth can turn on so you may see a slightly different menu, but the functions is the same. Click [Place Call] to get started. If the owner of the booth has set the booth up so that it charges callers for each call they place you’ll get an message asking you to deposit the required amount before you can place your call. 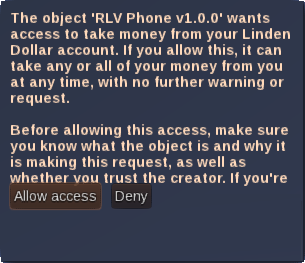 If this happens simply right click and pay the RLVPhone Booth just like you would any other object in SL. Enter the full name not the display name and click submit. If Ernestine the Operator – look it up you whippersnappers 🙂 – is on the job you’ll get connected and can IM your party. The owner of the booth can also set time limits on IMs. If one is set both you and the person you’re calling will get a warning a few seconds before the call is disconnected and your IMs are re-blocked. 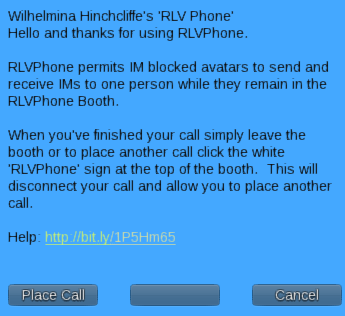 When you’ve finished your call you can either open the door and exit the booth which of course ends your IM exceptions and removes the TP restrictions, or if you’d like to make another call you can click the white “RLVPhone” sign at the top of the booth. Keep in mind that if the booth is set to charge a fee for calls you’ll need to pay it the specified amount again in order to place the next call. Don’t panic, I’m not clearing out your bank or anything, that’s the standard warning for any script that accesses your L$ account. If you’re uncomfortable with it just click the Deny button, but keep in mind that without that permission the booth won’t be able to charge for calls. At this point it’s ready to go, though you may want to set a few options first. You can access the settings menu – which is restricted to the owner of the booth – by clicking the blue DSS logo at the top of the booth. 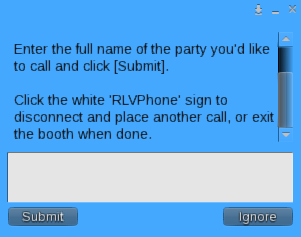 Clicking the Usage: button switches the booth from Public – meaning anyone can use it – to Private – meaning only active group members of the same group can use it. The +1 Minute and -1 Minute buttons allow you to set the length of each call up to 15 minutes. Setting the timer to 0 will permit unlimited calls. 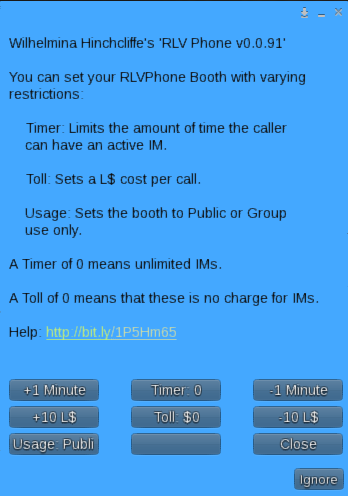 And lastly the +10 L$ and -10 L$ buttons allow you to increase or decrease the charge for placing each call. Setting the toll to 0 makes all calls free. First, RLV includes two ways of blocking IMs. Permissive and Secure. If a submissive has been blocked using a Permissive command then the RLVPhone Booth should work just fine, but if a Secure block was used then they really are incommunicado. The booth checks the IM blocks when someone enters it and will know they’re blocked with a Secure command. If so they’ll get a warning that they may not be able to communicate even with the booth. Second, keep in mind that this device is specifically made to permit people to get around RLV IM restrictions. It’s intended for roleplay and not as a tool for cheating past restrictions, but of course good intentions are the primary ingredient in the new eight lane Gehenna bypass on the road to hell. And that’s pretty much that. 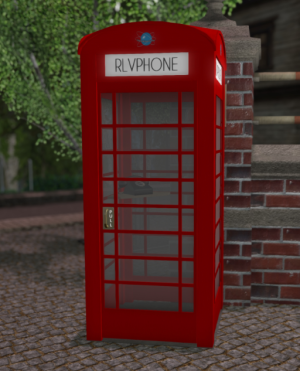 You can find the RLVPhone Booth at my shop in Orbitalis, or my Marketplace Shop. If you have any questions you can click IM Mina in Second Life.